PORTLAND, Ore., 2018-Feb-07 — /Travel PR News/ — The Portland Timbers today (Feb. 5, 2018 ) announced that the club has entered into a multiyear partnership extension with Alaska Airlines. As part of the continued partnership, the iconic Northwest airline’s wordmark will continue to be featured prominently on Timbers game kits and club apparel. In addition to being featured on Timbers jerseys, Alaska Airlines will continue to serve as the team’s official airline. 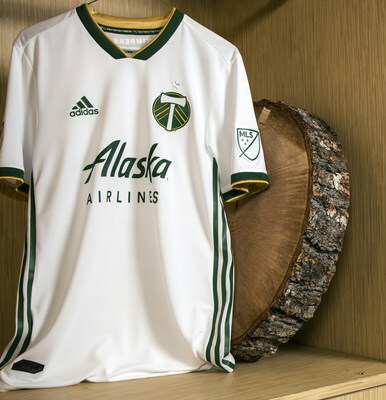 Alaska Airlines, a Founding Partner of the Timbers, has been the club’s jersey partner since its inaugural 2011 MLS season. As part of the partnership, Alaska Airlines will continue to support Stand Together Week and the Portland Timbers Community Fund as well as additional community initiatives. Alaska Airlines also will be a presenting sponsor for all MLS Timbers youth soccer camps. Among the many fan-friendly components of the uniquely interactive partnership, Alaska Airlines will continue its popular program to allow year-round early boarding privileges on its flights originating from Portland International Airport to fans wearing Timbers jerseys. The airline will continue to fly the popular Timbers Jet throughout its route network; the club-themed plane was unveiled in 2011 with a design inspired by two Timbers fans through a paint-the-plane contest. Alaska Airlines offers more nonstop flights (serving over 58 different destinations) and more daily flights (128 a day) from Portland International Airport than any other carrier. Alaska Airlines, together with Virgin America and its regional partners, flies 44 million guests a year to more than 115 destinations with an average of 1,200 daily flights across the United States and to Mexico, Canada and Costa Rica. With Alaska and Alaska Global Partners, guests can earn and redeem miles on flights to more than 900 destinations worldwide. Alaska Airlines ranked “Highest in Customer Satisfaction Among Traditional Carriers in North America” in the J.D. Power North America Satisfaction Study for 10 consecutive years from 2008 to 2017. Learn more about Alaska’s award-winning service at newsroom.alaskaair.com and blog.alaskaair.com. Alaska Airlines, Virgin America and Horizon Air are subsidiaries of Alaska Air Group (NYSE: ALK). This entry was posted in Airlines, Sports, Travel, Travel Management, Travelers and tagged Alaska Airlines, Andrew Harrison, Mike Golub, partnership, Portland Timbers. Bookmark the permalink.